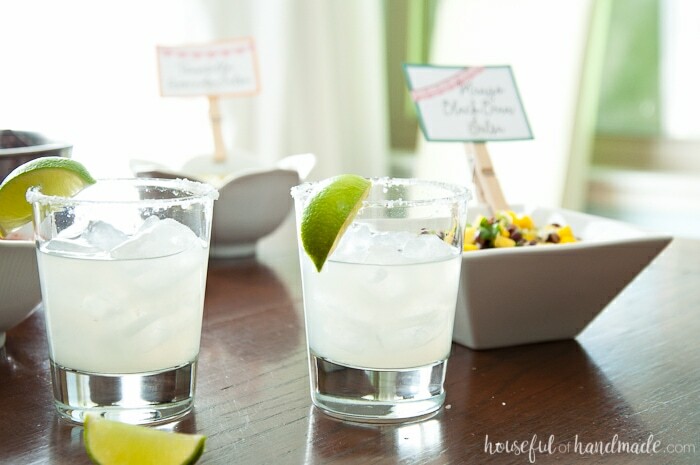 When I thought about what I would want for my birthday party, I wanted an evening with friends, some easy food, and a fun drink! Since I am a little “spicy” (according to my sweet husband), what better way to celebrate another year than with salsa and margaritas? I am a huge fan of salsa, not just plain salsa, but all different kinds of salsas. 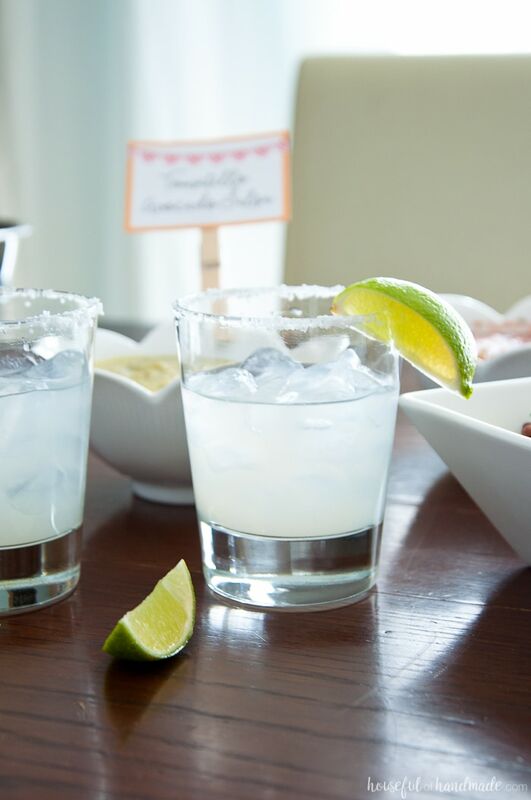 So for my party, I created this fun Salsa & Margaritas adult birthday party. I love to go all out for my kids birthday parties, but for my own party, I don’t want to spend the week leading up to it busy with preparations. Salsa is the best solution for this because you can prepare it super fast and even the night before. 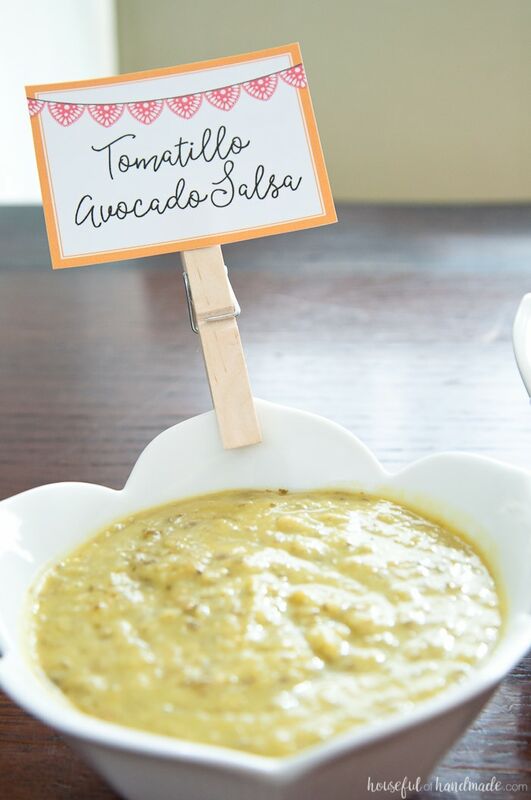 There are so many different recipes, or have each guest bring their favorite so you can try new ones! 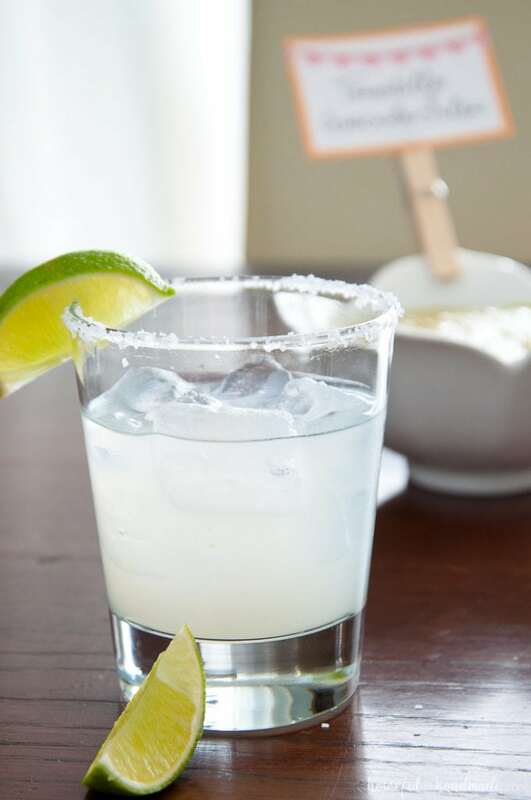 Then throw together a pitcher of your favorite margaritas (I absolutely love the Trader Joe’s brand margarita mixes, this is not a sponsored post, I just really enjoy both their original and mango mixes so I thought I would share) and you are ready to party! Of course you do need to make the party pretty, but again, not too much work, so I made a few printables to help you with that. 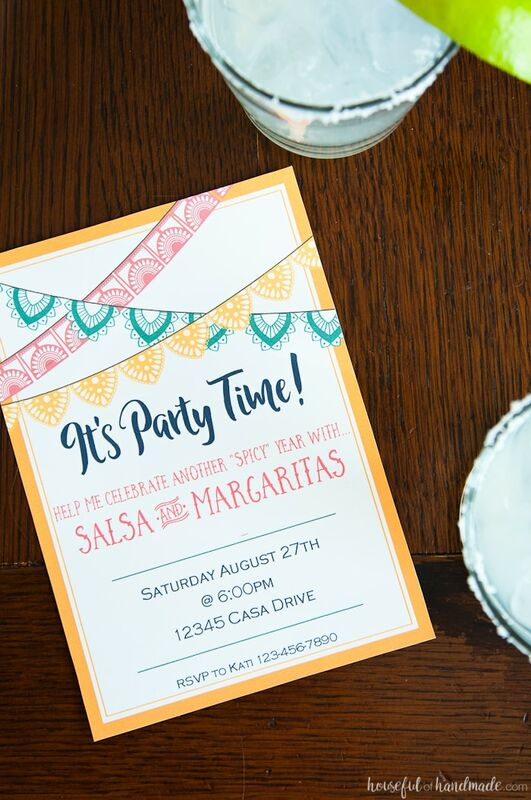 How about a “spicy” party invitation that you can print, text or send on Facebook to all your friends? 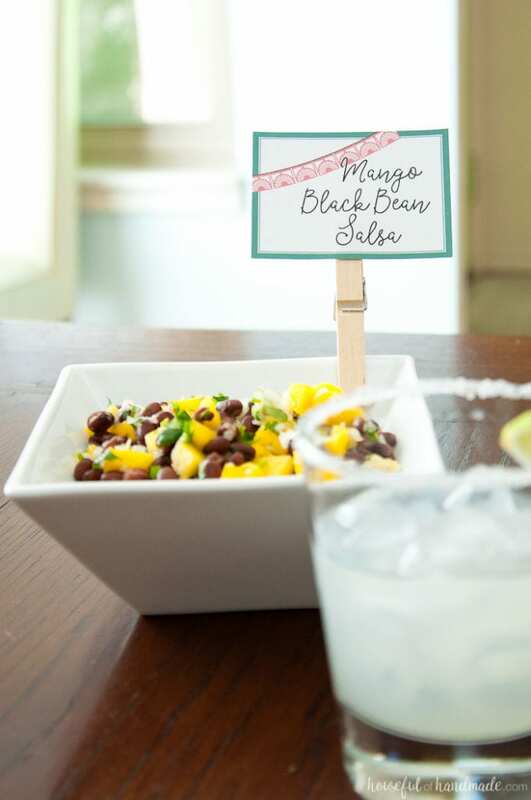 And for the party you will need some easy labels so everyone knows what kinds of salsa they are enjoying. If you want to get extra crazy, go ahead and add some balloons or a banner, but I’m keeping it really easy so my salsa & margaritas adult birthday party is all about the friends, food, and drinks. So now you are ready to party! Go ahead and have some fun, even though you are a year older. 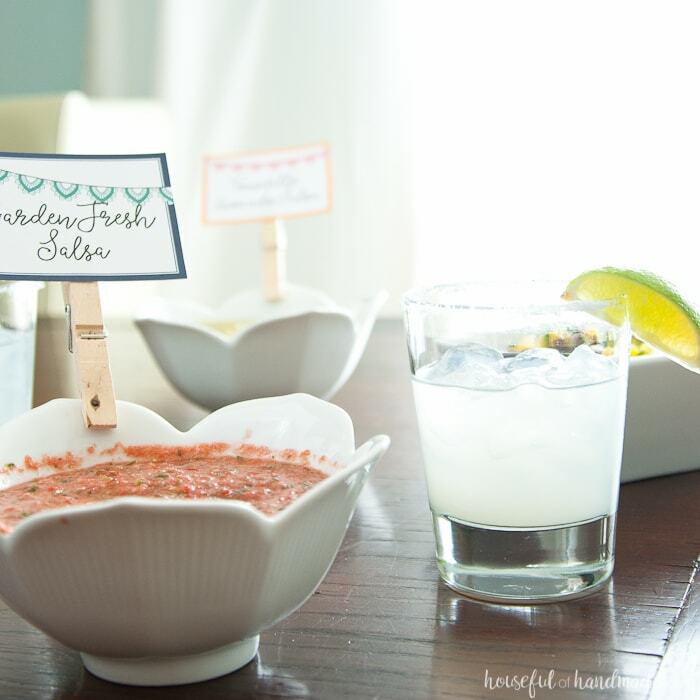 If you want to throw your own salsa & margaritas adult birthday party, you can download the invitation and food labels in my library of free downloads and printables available to my email subscribers. Sign up today to gain access to my Library of Free Downloads. Inside you can download the printables for this party and much more! 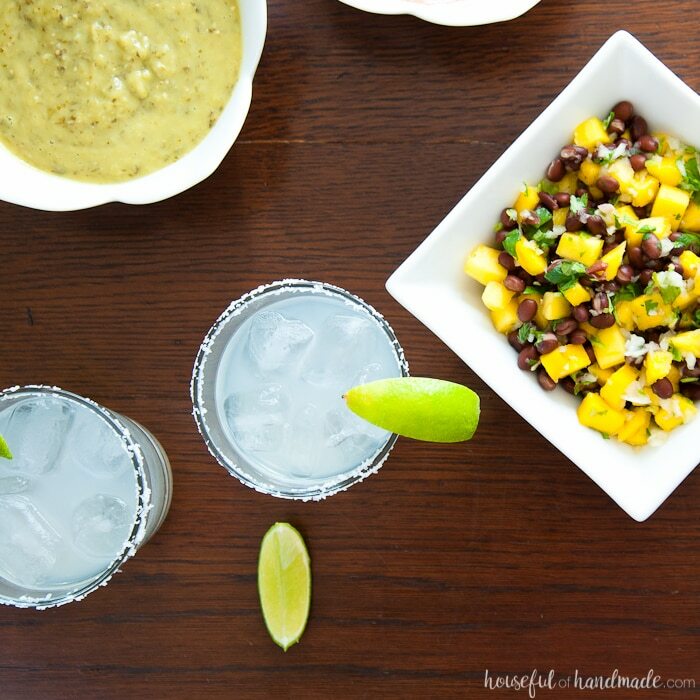 And of course, here are the recipes for 3 of my favorite salsa recipes! These are all super easy to make and delicious. 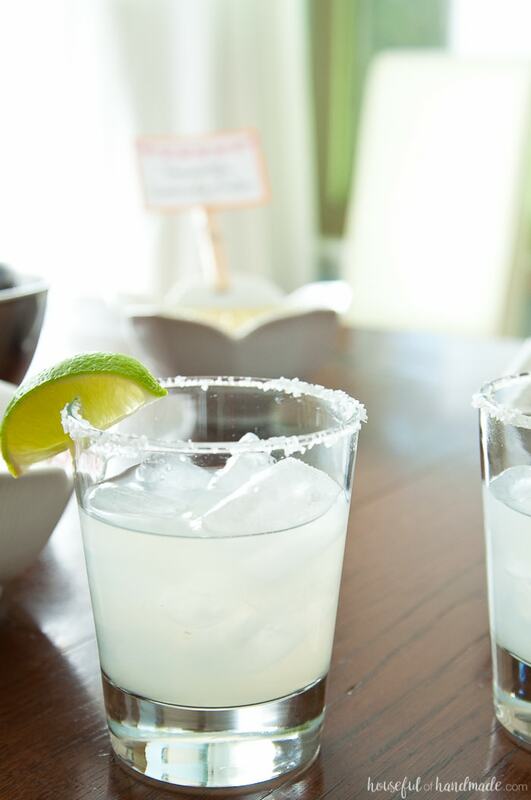 Celebrate another wonderful year with a fun and easy salsa & margaritas adult birthday party. 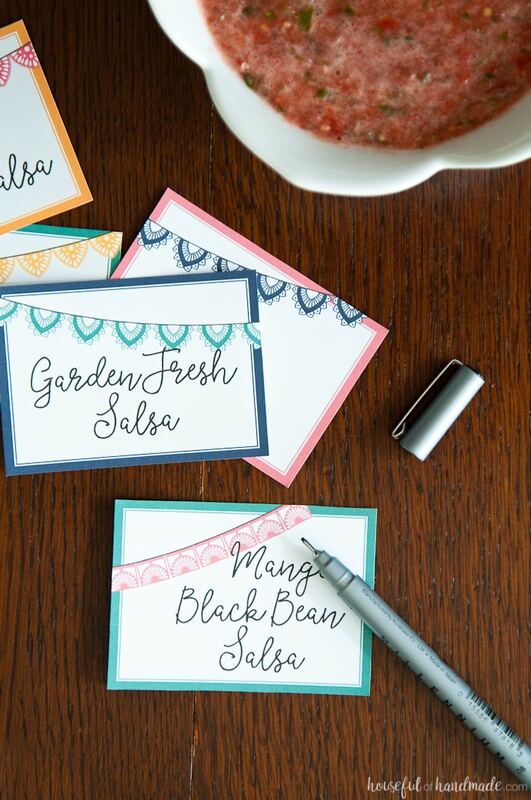 These 3 easy to make salsa recipes, digital invitations and free printables make this the easiest party to put together. Remove husks from tomatillos and place in small saucepan. Cut stems off jalapeños and place in saucepan. Fill pan with water until it just covers tomatillos and jalapeños. Bring to a boil and boil for 5-7 minutes until tomatillos are soft (some may start to crack). Remove from heat and drain water. Place tomatillos in blender or food processor. Add avocado, onions, garlic, cilantro, lime juice and salt. Pulse until blended and finely chopped. Serve warm or chill in refrigerator and serve cold. Roughly chop tomatoes, peppers, onion. Remove stems from cilantro. Juice lime. Place everything in a blender or food processor and pulse until blended and finely chopped. Allow to sit together for a couple hours or overnight to allow flavors to mix. 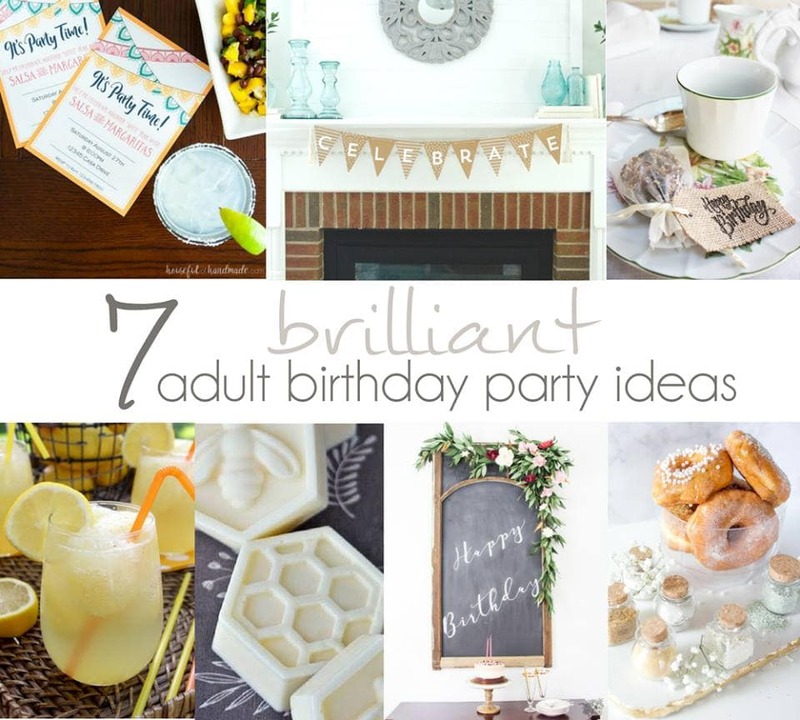 Don’t forget, this is a blog hop which means lots more adult birthday party ideas for you! Here’s to an absolutely amazing birthday party! Love that this is a no fuss birthday party. Thanks for sharing your party idea on Merry Monday. Pinned. Oh my word!! I LOVE this!!! Such a great project!! Thanks so much Maria. Margaritas are my favorite mixed drink so they are necessary for my birthday party! This all looks SO delicious! Must try! Love your invitation and food labels!!! Your party would be a hit with me and my family! We love salsa! Even my three year old will have a bite or two! I can’t wait to try your recipes! 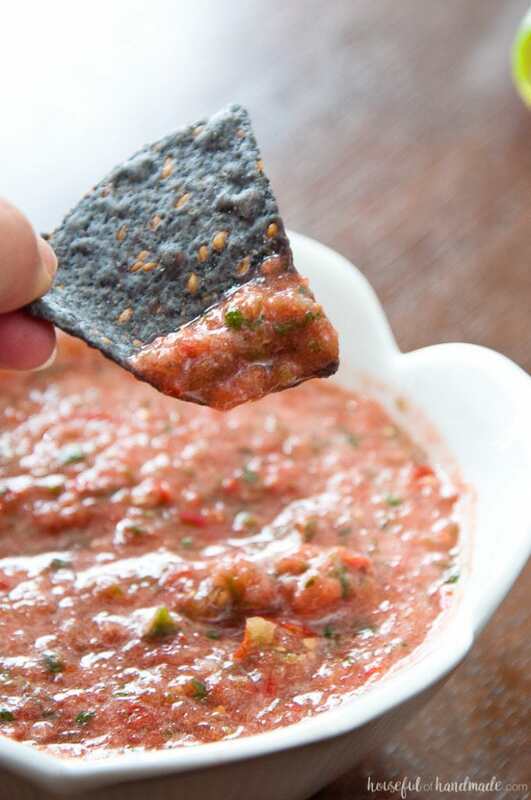 I love that your kids will eat salsa too! 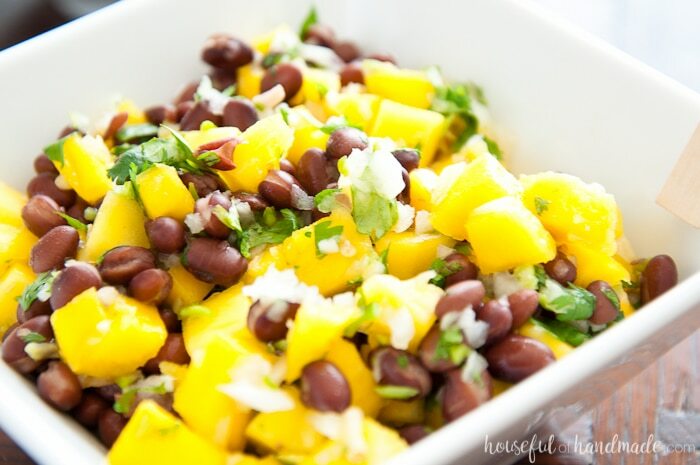 I am still working on my kids, they did love the mango black bean salsa but I kept it pretty mild for them. I am totally in love with your party idea Kati! I may have to steal this one for next year! Thank you so much for joining in on my birthday hop fun and a happy early birthday to you too!! Pinning!! Hey Kati – love your recipes and your creative party ideas! Your original invitation is beautiful. So happy to party hop with you today!